Just Baby Gifts & Apparel is a beautiful baby shop that grew out of the need for a working studio (away from two new kittens), and our love of color, design, hand arts and all things beautiful. We specialize in heirloom style Christening Gowns and hand smocked dresses and jon-jons. All of our items are designed and created by hand in our studio in Capitola Village, California. 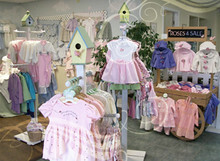 Our creation occurs in the garden shop, where we have unique designs of baby clothing including hand smocked and embroidered clothing, day clothes, play clothes, party dresses, boys jumpers, handknit sweaters and quilts. We also showcase some very special companies who create unique and precious baby gifts & clothing, including Mud Pie, Bunnies By The Bay, Sage Creek Organics & Bearington Baby.